"I could see that the Russia I had been reading about was still alive." Dr. James H. Billington has been the Librarian of the Library of Congress since 1987. Previous to this, he taught history in Harvard and Princeton, with a special interest in Russian history. Dr. Billington has authored books on Russia, including Mikhailovsky and Russian Populism (1956), The Icon and the Axe (1966), Fire in the Minds of Men (1980), Russia Transformed: Breakthrough to Hope, August 1991 (1992) and The Face of Russia (1998), the companion book to the three-part television series of the same name, which he wrote and narrated for the Public Broadcasting Service. 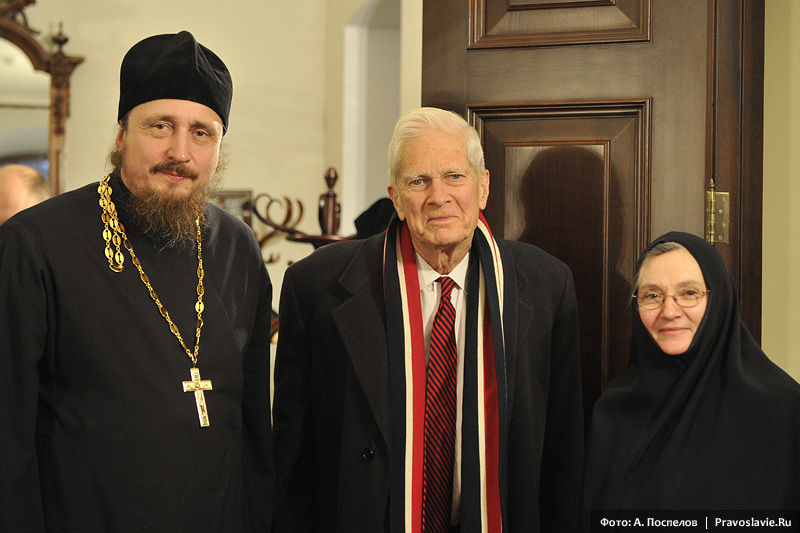 Hieromonk Pavel (Scherbachev) and Dr. James H. Billington at Sretensky Monastery. Photo: Anton Pospelov. 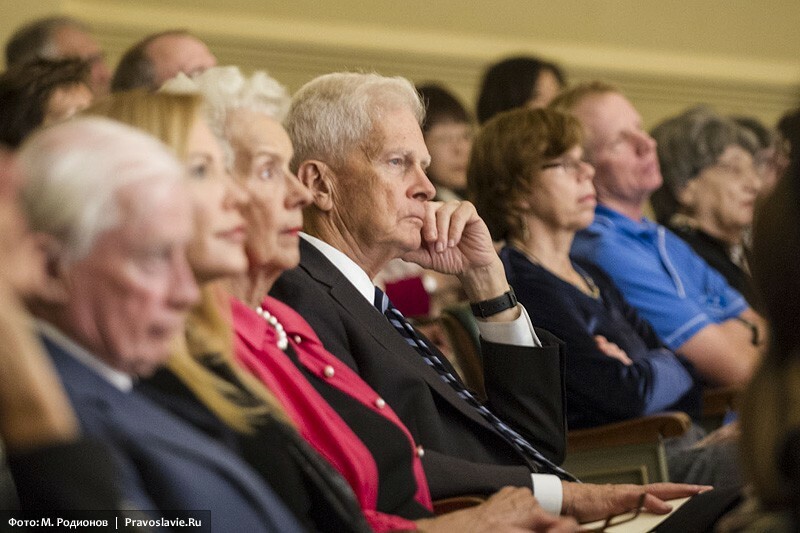 Dr. Billington has accompanied ten congressional delegations to Russia and the former Soviet Union. In June 1988 he accompanied President Ronald Reagan to the Soviet Summit in Moscow. He is the co-founder of the Open World Program, which invites emerging Russian leaders to visit various regions of the United States. Possessing a strong interest in Russian religious life, he has also accompanied church delegations to Moscow. Now, two months after Archimandrite Tikhon (Shevkunov) presented his book Everday Saints at the Library of Congress, Dr. Billington has visited the Sretensky Monastery, and we were given an opportunity to speak with this distinguished man. —Dr. Billington, you are well known in both Russia and in U.S. for your love of Russian culture and literature. Tell us about how you developed this love. What are your favorite Russian books? —Well, I fell in love with Russian culture by reading War and Peace as a schoolboy, during World War II. I then worked on the Russian language through the literature. The literature took me through a process of proniknovenie, or delving into the culture. Eventually I began to study Dostoevsky, later Soloviev, and the entire remarkable, Orthodox Christian history that is at the base of Russian literature. It always seemed to me that there are three things that make Russian culture rather unique: One is its remarkable feeling for “space”, for nature. There is also the constant interaction with other cultures—Russia has been a multi-ethnic society from the very beginning. But the third force which really gave it cohesion was the Russian Orthodox Church, which has continued to influence the great writers, the music, the culture, and of course the whole condition of a basically pictorial theology, as I would describe it. I am speaking of the beautifying of the faith pictorially, concentrating not so much on theological argument, but rather celebrating the beauty, the mysteries, and the continuity of the Christian faith. As a Christian myself, I found this a very moving and enriching experience; in America we are more familiar with the Protestant and Catholic versions of Christianity. The Orthodox faith was a great discovery. Beyond that, I got to know and to see so many of the Russian people. Even in Soviet times, and certainly since then, I saw that there is so much good, so much positive, and such longsuffering in the Russian spirit that it has reinforced my interest. Most of the years in the middle of the 1960’s were spent by me and my family in Russia, and my children even attended Russian schools—at the height of the Cold War. So this has been a lifelong interest for me—to teach about Russia, and to get to know the Russian people better. —Besides your work at the Library of Congress, you were also, among many other things, a twenty-year member of the editorial advisory board of Theology Today. You have seen Russia in all different stages of recent history—you were here when religion was repressed, and later witnessed the return of churches to the Russian Orthodox Church. As a religious man, what is your assessment of these changes? 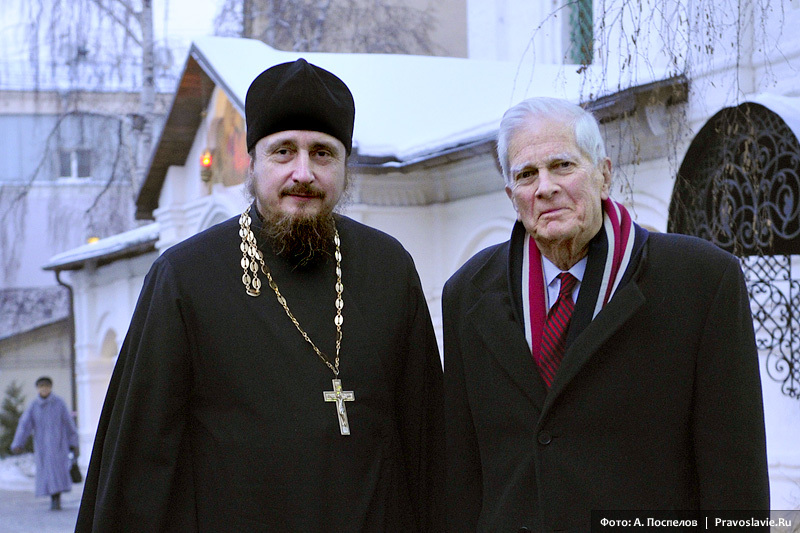 — When I came to Russia in 1958, during Soviet times, I first of all saw the survival of the Church. That was a time of new repressions under Khrushchev. Most people outside of Russia did not realize that there was still religious repression under that regime. But the perseverance of the Russian people could be seen. I had also previously come with Church delegations during the Soviet period, and saw the continuity. The first time, I went to Sergeyev Posad, to the Holy Trinity-St. Sergius Monastery, and the new repression under Khruschev was obvious. It was not as bad as under Stalin, but it was still present. Nevertheless, there was a great deal of faith. I went to a couple of classes in the seminary, and I could see that the Russia I had been reading about was still alive. The Soviet Union was the first place in world history where a system had been set up specifically to reject religions of all kinds; it was ecumenically rejecting religion. But rather than this new system being a success, it was actually a success of the older faith, which survived amidst great difficulty although not without some compromises. Nevertheless it was a survivor and even a reviver in a later period. I think this is interesting, because I am not sure that so many people in Europe, America, or even Russia think that we live in a post-Christian era. The media and popular culture is very indulgent. It is not particularly representative of ordinary people, of what they believe and think. I think this is true of both America and Russia. I was also here during the days of August, 1991, when the coup attempt happened, and I wrote about that. You could say that it was no coincidence that the coup began on the feast of the Transfiguration, which is one of the great iconic subjects, one of the great feasts of the Orthodox Church. There was another visual image of Orthodox Christianity that played a role then: the image of St. George the Trophy Bearer. It seemed that Russians were not just discovering modern technology and other things from the West, in which they hadn’t been fully able to participate, but they were recovering their own past—the forgotten part, the religious part of their own heritage. So, Christianity is spreading in many forms. I suppose it is all God’s Providence. It is growing in many different ways, and in many different degrees in people. It is not just a matter of faith, although it always is that, but of—and this may stand up to scholarly investigation—a flourishing of Christianity—mostly in the southern hemisphere, but also in America and Russia, which are frontier civilizations on the outskirts of European civilization. We now have a joint program in the Library of Congress with Russia of digitalization of documents called, “The Meeting of Frontiers”. These two frontier societies have developed later than European civilization—American society even later than Russian society, which basically developed in the eleventh century; that is when its distinct identity began. It is about the survival of religious faith. Many people came to America to escape religious persecution in their own countries. But I think that both these countries have a survival of Christianity, although it is somewhat chaotic. It is a revival deep in the human spirit, and widespread in people who don’t necessarily control the media. Those people have better things to do than to waste their time with celebrities’ divorces, and the like. —Dr. Billington, as we speak about the cooperation of cultures on a religious platform, perhaps the performance by the Sretensky Monastery Choir in the Library of Congress was a kind of model of presenting religious art. What was your impression of this concert that took place there two months ago? We were of course very happy to have them perform, and particularly happy to have them perform religious music. Although it was modern music, and I more prefer Znameny chant, because I am interested in the period of the Old Believer schism and the traumatic contact with the West under Tsar Alexei Mikhailovich. I relate that period to the general religious crisis happening during the religious wars of Europe. I feel it was part and parcel of the same thing. We have an exhibit in the Library of Congress of “Russian America”, mainly of Alaska—the archives of the Russian Orthodox Church in North America. It is a very moving story, because they recorded many languages and played a very educational role in part of what is now America. 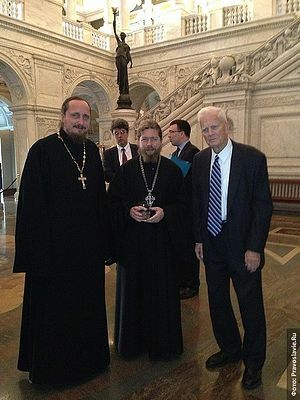 In addition, there was recently a very successful presentation of the English language version of Archimandrite Tikhon (Shevkunov’s) book, Everyday Saints and Other Stories in the Library of Congress. This is a very nice book, because people don’t pay much attention to everyday saints. You get a lot of publication in the media and everywhere about everyday criminals and everyday scandals, but you don’t hear much about everyday saints. I for one would like to read more about everyday saints. Their stories are not always told. Ithink this book could have a strong resonance with American people as well. —We thank you Dr. Billington for taking time to talk with us.